Next week Pretty Portal will release "Agent O", the latest screenprint from FinDAC. 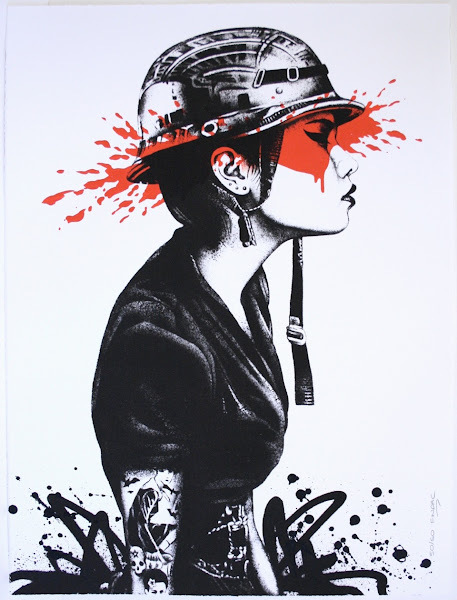 "Killer Instinct", the last screenprint from FinDAC sold out in minutes. FinDAC has also recently painted the key visual for the STROKE Artfair in Munich, so it is to be expected that the demand on works from FinDAC will rise. Handpulled Screenprint with painted colour splash in acrylic and additional spraypaint styles and splashes on Somerset 300g/m, 56x76cm, signed & numbered. The color splash and spraypaint styles are handpainted, so every print is slightly different and unique.